Presented by the Estate of Sir Aurel Stein, 1963. This rhyton and a small bronze bowl or ladle with a projecting horse’s head ([EA1976.122], also transferred from the Dept. of Antiquities) are, with the exception of a copper hoard harpoon [EA1986.13] and axe-head, the oldest metal objects from the Indian subcontinent in the Museum. Discovered when a portion of hillside fell away, they are also exceptional in that their find-place is accurately documented. The vigorously but rather crudely modelled solid cast figure of a bearded centaur derives from Graeco-Roman models. The small animal, an ibex, is held between the centaur’s hands by a pin centrally located through its body, allowing the little animal to remain horizontal while the rhyton is tilted by the drinker, who received his beverages through the centaur’s male organ. 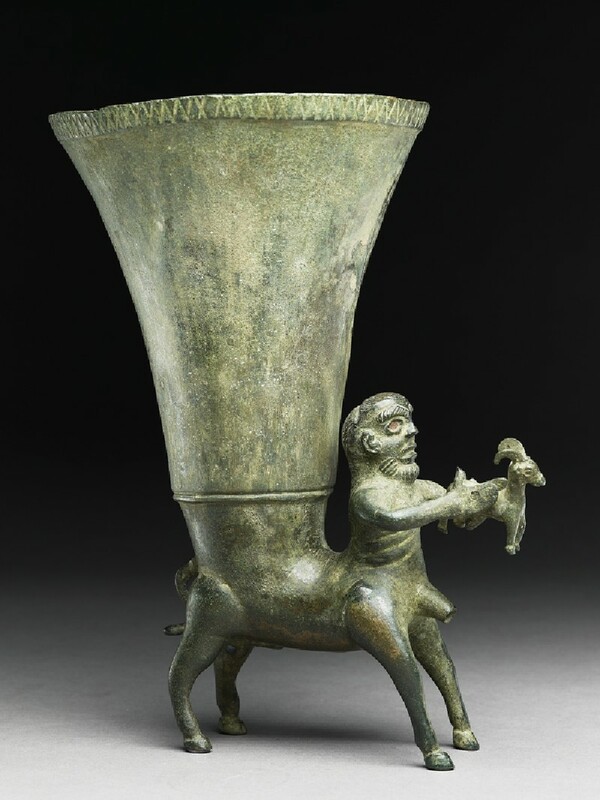 Animal rhytons, sometimes simply terminating in animals heads [see EA1962.42], can be traced back to Achaemenid times. A recent metal analysis suggests that the two objects come from quite different cultures and, as part of a hoard, which seems highly likely, may have been made at a considerable distance in time from one another. The little bowl is almost exclusively copper; the rhyton is a leaded bronze of the type (although the lead content is very high) common in much of the ancient world in the centuries before and after the beginning of the era. There may, of course, have been other objects in the hoard, which were not turned over to the authorities, those in precious materials in particular. A solid link has been established between the small bowl and graves in the Pamirs in Tadjikistan, U.S.S.R., of the late centuries B.C. Very similar, but entirely zoomorphic rhytons in terracotta, on the other hand have been found at sites in ancient Bactria, dating from Kusāna times. This tallies with the generally accepted assumption that the forms of metal wares subsequently gave rise to terracotta analogues, rather than vice-versa, and would tend to place the rhyton in the last two or three centuries B.C. It has further been suggested by Professor Jettmar (correspondence) that rather than being part of a local magnate’s treasure imported into Dardistan, the ancient name of the region where they were found, the Museum’s two objects were part of the ritual equipment of a tribe, the “Horse-people” of the ancient sources (Skt. Asvakayana, Grk. Assakenoi) who ruled over the mountains west of Tibet.